Angew Chem Int Ed Engl. 2012 Jan 13. doi: 10.1002/anie.201107700. Gang Wu and coworkers are presenting in this short communication a molecular dynamic simulation to elucidate the free-energy landscape for the movement of three monovalent cations (Na+, K+, NH4+)through the central channel of a tetramolecular oligo G-quadruplex (OGQ). The importance of this work strikes in the potential use of OGQs as synthetic ion channels, an application that has been considered by a number of research groups in last decade. To perform this study they divided the ion movement in two regions: inside the OGQ and at the entrance/exit region. They found that for the inner OGQ region, Na+ showed a lower energy barrier (4-5 kcal/mol) when compared to K+ and NH4+ (13-15 kcal/mol). They made reference to experimental data to backup these computational results, plus they argue that the ionic radii differences between them are responsible for the observed energy barriers. K+ and NH4+ have similar ionic radii (1.51 and 1.66 Å for octahedral coordinate ions respectively) while Na+ (1.18 Å) being a little bit smaller can diffuse through the tetrads easily. They also highlighted the possibility of having what they refer to as “leaks” through the tetrad (sideway movement of ions) instead of the proposed continuous ion movement through the central channel. They basically found that the energy barrier for that ion movement is too high (50-60 kcal/mol) to make it possible, discarding this possibility. I have to bring an issue related to their expression in this paragraph (second page, first paragraph), because they mentioned and I cite: “ there has never been experimental proof that ions would not “leak” out from the side wall of the G-quadruplex channel”. I know the authors are emphasizing in the study of ion movement for OGQ’s but we know that there are OGQs and supramolecular GQs (SGQs) self-assembled from a variety of guanine derivatives. So, in my view they should’ve specified that lateral ion movement haven’t been shown for OGQs (perhaps in a note), but it had for SGQs. Specifically, in 2006 the Davis group reported (JACS 128 (47), 15269) the first evidence of “sideway” displacement for cations in a four-tetrad (4T) SGQ (i.e. a hexadecamer formed from the dimerization of two octamers). The mechanism of exchange of course would be different in a 4T-SGQ like Davis’ when compared to Wu’s 4T-OGQ and we can discuss those on Fridays presentation. In the second region, the entrance/exit sides, the energy barrier encountered for K+ and NH4+ was 20 kcal/mol, while for Na+ was 14 kcal/mol, both values correlate well with the experimental data reported in the literature. Another important point of discussion the hydration states of these cations. The inner cations are fully dehydrated while the ones located at the entrance/exit positions might be hydrated because of the transition to/from the bulk media. From my point of view the most important part of this report is their comparison with a potassium ion channel. All the gathered computational data reveals that the use of this or related sequences as K+ channels need to overcome significant energy barriers, even for the smaller Na+, if they are to be used as synthetic ion channels. Although my technical knowledge of how to perform MDS is minimal, they contribute a very important part for the development of a molecular research project. I think it will be great to have some fundamental MDS studies for some of our derivatives in relation to the ion movement not only in organic media, but also in aqueous environments. As we have discovered in recent years, not all SGQs behave the same even if they have the same central guanine core in common. Cations play a very important role in controlling these assemblies and I believe there is a need to put more effort in this regard, in particular with our system. Any volunteers? A good taste of theoretical studies with experimental findings is founded in this article. Much of the work of Gang Wu is founded in metal ion binding studies in GQDNA. In this article, the role of GQ artificial ion channels is studied in terms of energetic viability of the system. With Molecular Dynamics, energy barriers of GQ used like ion channel of cations like K+, Na+ and NH4+. In a competitive area in ion transport channels, theoretical studies are available for carbon and cyclic peptide nanotubes but not for GQ DNA. According with this work, the used adaptive biasing force (ABF) methods in MD simulations to obtain 3D free-energy landscapes for K+, Na+ and NH4+. The studies reveal that K+ and NH4+ have high free-energy barriers of 13-15 kcal/mol in comparison of Na+ with an energy barrier of 4-5 kcal/mol for moving through the GQ DNA channel. Also, theoretical studies evaluating leakage though the GQ DNA wall was achieved demonstrating high free-energy barrier for leakage. The article is simple, bit very important because the author mention that this is the first time that these studies are realized in GQ DNA. But there is a need for more techniques or tools to study the availability of GQ DNA as ion channels. What are the requisite for the classification of a GQ DNA as an optimum ion transport channel? In terms of stability, what are the components of design that can be modulated to obtain artificial channels? There are lots of questions in the shadow of the development of these systems. For me, the role of water in these theoretical calculations is very important to understand. I know that the role of time and the free energy are the key for these studies. But, how water molecules affect the ion movement and the channel exterior/interior structure of GQ DNA? This question is ignoring the role or contribution of H-bond and other NC interactions in terms of ion channel structure and ion movement though these artificial channels. About MMH synopsis, I think that explain clear and briefly the article that it seems simple, but have some complex data to understand. She’s an expert in quadruplexes, so I like to read her synopsis not only to understand the article but also to see her point of view in the area. The figure is perfect to explain the reported work of Gang Wu. In this article Gang Wu and colleagues reported quantitative data on the energetic and dynamic properties of ion movement through a GQ channel based on molecular dynamics (MD) simulations. These was done by means of unconstrained MD simulations using the adaptive biasing force (ABF) method which allows the authors to construct unprecedented three-dimensional free-energy landscapes for ion transport (Na+, K+ , and NH4+) through a GQ DNA channel. The potential of mean force (PMF) profiles for the movement of ions inside the channel suggest that for bigger ions like K+ and NH4+, moving within the inner channel between the two exit/entrance points has a significantly higher energy barrier than for Na+ which is smaller and therefore can pass much easier through the center of a G-tetrad (central channel). Also, the authors reported that for all three ions evaluated, when ions are located between two exit/entrance points of the inner channel those ions would not exit the channel through the channel wall. In addition the authors reconstructed 2D PMF topographic profiles to determine the free-energy barrier for the movement of ions on the exit/entrance point towards the bulk solution. In general it was remarkable that the quantitative and qualitative data extracted from the simulations reported in this article seem to be in good agreement with most of the experimental data in the literature regarding ion movement in GQ structures even though the experimental data was sometimes not gathered using the same GQ sequence. However, as Mariana, I also think that the authors should have include at least a sentence mentioning that for SGQs the story of “leaks” through the sides might be different and supplement that with Davis’ reference. It was good to find many details on the supporting information about how the authors prepare their initial model. In general, the initial model is based on the parallel-stranded [d(TG4T)]4 GQ structure after removing the distamycin molecules from the NMR structure of its complex (PDB code 2JT7) and by adding the ions under study, the appropriate counter ions to neutralize the structure, and a box of water. Of course in this last and short sentence I didn’t mention all the multiple minimization steps and other processes done to the structure, but is good to know that the authors have a very good supporting information with this and many other important details. What I really like the most from this article is that through the narrative the authors constantly compared their results with experimental data from the literature giving the reader the necessary information to understand the reliability of their findings. As we know, if we want to talk about metals in GQs Mariana is the right person to call! jajaja Her synopsis is very good because besides describing the main findings of the article she also incorporate constructive critical insights through the narrative. Also, the additional reference that she includes helps us to see a different perspective more relevant to our group that works with SGQs. I very much like her picture since it was really eye-catching and it was appropriate for the article even though it give the impression that the system actually works as an ion channel but honestly for now I don’t see an easy way to show that the possibility for ions to exit would be difficult considering that we have two potential entrance and/or exit sides. Gang Wu who has being an outstanding investigator in the GQ field, specially in the NMR structure elucidation, presents a different approach to study the G-Quadruplex (GQ) ion channel. Here Wu and coworkers used the adapting biasing force – molecular dynamics (ABF-MD) method to study the dynamics and energetic landscape of the cation movement in the GQ channel and in the bulk solution. Three different cations were investigated: Na+, K+ and NH4+. But what is the role of the counter ion in the cation movement? Can this computational program take this in consideration? This should have an effect in the movement, at least in the bulk solvent. Or may be at this salt concentration this can be ignore. In contrast, nothing was mentioned in these regards. The results regarding the peripheral movement of the cations were new for me. I had always thought that these cations were less stable than the inner cations since there were in partial contact with the bulk solvent. I also realized how the ammonium ion diffused faster than the K+ and Na+ trough the bulk solution due to the proton exchange capability and that this proton exchange capability is what enables the existence of water molecules inside the GQ channel, reason why GQ templated by K+ or Na+ don’t have water in the inner cavity. The explanations were clear and very pedagogical. They put them in perspective with the exciting experimental data by summarizing the findings in a very concise way. In my opinion, this is an interesting article helped by an excellent narrative. Marianas’ synopsis and picture were good. The synopsis was a little long for the paper extension but she makes it interesting by giving her opinion and bringing new arguments to start a productive discussion. The picture summarizes the paper very well. After reading this synopsis I realized that most of the time researchers that investigate oligo-GQs don’t take in consideration what is happening with supramolecular GQs. In contrast, researchers from the supramolecular GQ field usually take in consideration what is happening with oligo-GQ. In this article, fundamental studies of ion movement within DNA G-Quadruplexes are studied. Free energy landscapes were constructed using Adaptive Biasing Force (ABF) MD simulations. The obtained results are consistent with the small amount of data offered by the literature. The first thing they explore is movement of ions along the channel of the quadruplex. They constructed the free energy diagrams for this process. Their data supports that for Na+, K+ and NH4+ the most stable position in the channel in between tetrads. Due to their size, K+ and NH4+, experiment higher energies while moving thru the channel. Na+ on the other side is smaller and experiments a less radical change in free energy, implying that its movement thru the channel is more dynamic. Another thing they explored is “leakage” of ions thru the sides of the quadruplex. They found that the energy necessary for the ions to leave the channels thru the walls is 4-5 times higher than thru the openings at each end. Finally they investigate the hydration of the ions inside the channels. Ions are typically stripped of water as they enter the channel, having on average 3 water molecules while placed in the entrance of the channel and are quickly hydrated as they leave. I don’t know if the narrative of the article is really good or I am just accustomed to this type of article. I had no trouble understanding any of their procedures or findings. Their figures were also really nice and summarized their data nicely. There were no spelling or grammatical mistakes that I could find. What made it easier to read was leaving all of the computational details in the Supporting information. Marianas synopsis is really good, covering each aspect of the article really well. The figure is just what they describe, nothing too original there. I like the reference she makes to an article by Davis because, without it, I would have never considered lateral movement of ions to be possible. Good Job! Gang Wu et al. present their work in which they utilize the adaptive biasing force method in order to construct free energy landscapes for ion transport in GQ DNA channels. They divided the movement into two regions: between the two exit and entrance points and from the channel exit/entrance points to the bulk solution. The PMF profiles for ionic movement showed that for ions that are greater in size there was a higher energy barrier, than for smaller ions like sodium that should move more easily through the central channel of a G-tetrad. Aside from that, they found that ions do not exit through the channel wall of a G-tetrad when they are between exit/entrance points. All their results were in accordance with the data that has been previously published on the matter. I thought this was a nice paper, very easy to read. This was mostly due to the fact that they didn’t clutter it with a lot of random data, they went straight to the point. Some data was just better off in the SI, and they made note of it. I liked the work itself, and I’m curious to see what they find when they apply this to other GQ structures. As for Mariana’s synopsis, I think it was very well done it was very complementary to the reading of the paper and it was nice to read it before reading the actual paper. As for the image, it’s pretty standard, not much else I can say about it. This week’s article details the results of a set of Molecular Dynamics (MD) studies of ion movement through the central channel of a DNA oligomer folded into a quadruplex structure. They the study of movement through the quadruplex (defining entrance and exit points) along a defined reaction axis (z-axis, along the quadruplex ‘pore’), and between the bulk and quadruplex entrance/exit, separately. Within the pore, they calculate the potential mean force (PMF) profile along the z-axis, a 2D PMF landscape for lateral (x- or y-axis) movement at each point; in the outer region they obtain similar 2D profiles for a series of points along the reaction coordinate; additionally they assess the hydration number of ions right at each point along the reaction coordinates (in both regions). They find that the calculated barrier to sodium ion movement is considerably less than that of potassium or ammonium ions, that lateral ion exit (‘ion leak’) is unlikely, that a small degree of hydration inside the channel may be likely; they correlate all these findings, and the energies calculated, to the (scant, and often tentative) experimental results available for similar systems in the literature, and find they to be broadly in agreement. The article is impressive in degree of quantitative correlation they find between their results and the experimental results available to them. They tell the story well, and appropriately for a general chemistry journal: while, unlike some of my colleagues, I don’t feel that I understand every detail of the work, they make it possible for a non-specialist to get the high points, and then going into more detail in the ESI. While I understand Mariana’s complaint, I felt it was pretty clear that when they refer to Q-quadruplexes, they are referring to G-quadruplex DNA. We spend a lot of our lives thinking about such structures without backbones, but even for people like the Wu group, who have worked with such structures, they are not was most think of when you say ‘G-quadruplex’; for instance, if you look at the Wikipedia entry on quadruplexes, you won’t find anything on structures without backbones (perhaps we should fix that). On the other hand, I was surprised to hear anyone say that “computational results provide a definite proof” of anything. Mariana’s synopsis concisely covers the most important points and, while I would be a little more charitable, brings up an important omission to what otherwise appeared to be a through comparison to relevant literature. It will be interesting to see if the further research underway in their lab will address this, doing similar studies on a system where ‘leaking’ has been observed. 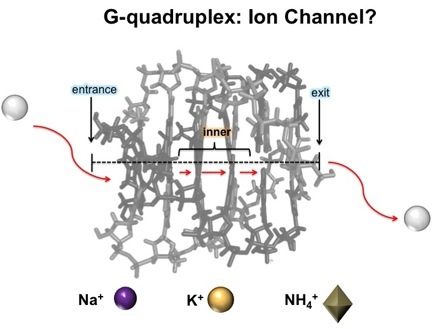 The article explores the movement of ions (Na+, K+ and NH4+) through a GQ channel as researched by Gang Wu and coworkers. Using Adaptive Biasing Force (ABF) Molecular Dynamics (MD) simulations, free energy landscapes were constructed. Na+ showed a lower energy barrier (and smaller size) in comparison to the ions K+ and NH4+ which can indicate why it passes more easily thorough the ion channel. They also explored “leakage” in the GQ wall, finding a high free-energy barrier for it. And finally they discussed the hydratation states of the ions and how the innner cations are completely dehydrated in comparison with those at the entrance/exit region. I think the article was well written and very clear. I was surprised to find out I could understand most of it even though I have very little knowledge about many concepts discussed. Still, I have many many questions but I guess I will tackle them along the semester. Mariana’s synopsis was also good and it really helped me a lot. It really summarizes and explains each one of the aspects in the article. And I really liked how she referenced Davis because it gives an important reminder about how sideway displacement has not been shown for the OGQs, but it has been shown for the SGQs. Something we might have not thought of otherwise. Besides, it also tells the reader that Mariana knows what she is writing about. Gang Wu and coworkers present the adaptive biasing force (ABF) method in molecular dynamic simulations to obtain the 3D free-energy landscapes for ion transport of Na+, K+ and NH4+ through a G-quadruplex DNA channel . Results showed that K+ and NH4+ ions have a free-energy barrier of 13-15 kcalmol-1, however, Na+ movement is smaller, 4-5 kcalmol-1. This difference in energy is understandable according to the difference of their ionic radii, because of this, sodium ions can be considered to diffuse through the channel . It is assumed that ions move through the channels of the G-quadruplex, but their is no proof that ions move out from the side wall of the channel. 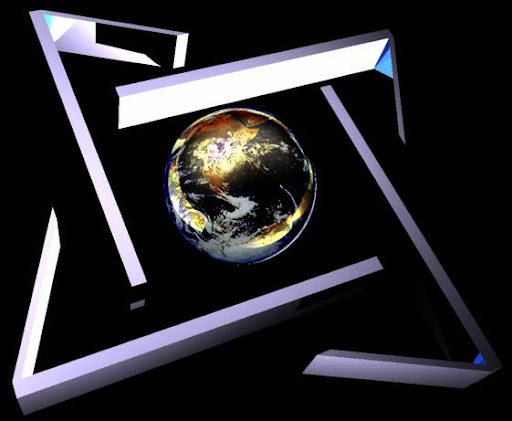 To test this PMF profiles were obtained and results demonstrated that for the sideways ion movement the free-energy barrier was significantly larger for the three ions. Other studies showed that the free-energy barrier for ion movement to the bulk solution is 20 and 14 kcalmol-1 for K+/NH4+ and Na+. They also study the hydration states of the cations. When ions enter the channel they are dehydrated and the one sat the entrance and exit are hydrated. This was a nice to read article and easy to follow. The necessary information and details were given and explained in a way that wasn’t confusing. Mariana’s synopsis is nice, it summarizes the main findings of the investigation and its easy to follow. She also gives her critique. The picture is very appropriate. Gang Wu and colleagues present in this communication MD studies regarding the ion movement inside a G-quadruplex structure using three monovalent ions, Na+, K+ and NH4+. For their work they make use of adaptive biasing force (ABF) method to obtain three-dimensional free-energy landscapes for ion transport through a GQ DNA channel. The studies presented were divided into two regions: within the channel pore between the entrance/exit points and the other from the channel exit/entrance points to the bulk solution. The first part of the studies permitted the authors to determine the free-energy barrier of the three ions, being Na+ the one with the lowest free-energy barrier, 4-5 kcal/mol. This results correlate with the ionic radii of each ion. Therefore, it is expected that the ion with the smaller ionic radii shows a lower free-energy barrier, meaning that it will pass or navigate through the channel with less difficulty. To verify the data obtained they compared their results with experimental data from previous works. They also expressed the fact that no leakage will occur from the channel’s walls as computational results provided them with this information. The second part of the studies, the movement of the ions from the channel to the bulk solution, permitted them to construct free-energy landscapes and conclude that the free-energy barrier for ion movement from the channel site to the bulk solution were approximately 20 kcal/mol for K+/NH4+ and 14 kcal/mol for Na+. To make their conclusions they also compared and analyzed the exchange rate constants. In conclusion, the authors were able to obtain free-energy landscapes for the movement of three ions using MD simulations. Although much work in this area is still required and needed, they made an effort and present interesting and clear data of the energy and dynamics of ion movement on GQ DNA. I have to say that I enjoyed reading this paper, which was easy to follow and understand. Even though I’m no expert on MD simulations, the work they did and presents has a very promising future and it definitely may be used for different purposes. As for Mariana’s synopsis it was really well written and organized, as always, and captured all the essential details and information. The picture was nice and right to the point. This paper by Wu presents the computational study of oligo-GQ working as an ion channel for Na+, K+ and NH4+. They divided their studies in 2, the study of the free energy barrier of entering and exiting of the ion from the channel and the ion exiting from the GQ to the bulk. In the case of K+ and NH4+ they see a greater free energy than for Na+ because of its radii for the entrance and exit of the ions. In the case of he bulk ion interaction on the entrance and exit of the channel they see a greater energy for K+ and NH4+ compared to Na+. Later they continue correlating their findings to already published data from other researchers. Other than this they added a water prescience study in the channel with NH4+ as a cation due to its possible proton exchange. Although it was a interesting paper to read, on the water presence study they mention “we do observe that occasionally water molecules enter into the channel to be within the first coordination shell of NH4+, resulting in a fractional number of coordination water molecules around the NH4+ ion.” I don’t understand what they mean with “first coordination shell”, as in, where is that within coordination the channel. Other than this on figure 1b the z axis should actually be the y axis. Synopsis wise Mariana always does a good job, seems like you are actually talking to her. And the picture seems to be very appropriate. This weeks article shows the results of computational studies of the movement of three of the many cations that have been shown to promote QG formation. Their results show a clear difference between the behavior of the cations well inside the GQ core and the ends of the channel. This work is particularly well suited to be studied by molecular dynamics considering that direct empirical data on the flow of cations through a GQ tunnel is very challenging to achieve. Notably, the paper concurs and expands nicely to what little experimental data has been obtained. If I recall correctly, Marilyn once mentioned that the flow of cations in our MD studies seemed to have certain directionality: once an “entrance” and “exit” was chosen, they would the flow of cations would remain in the same direction. Regardless of, because of their reference to ion channels, I was hoping that they would mention if they could see any directionality. Also, as Mariana mentions, as follow up, it would be interesting to compare other (divalent) cations. For example, the difference between the strontium and potassium cations would be an interesting addition to the metallo-switch communication. The narrative of the paper is simple and I find it accessible to most audiences, regardless of their experience in the field. The figures that accompany are also appealing and illustrative of their discussion. (Angew Chem should really consider not charging extra for color in their publications, considering how much it adds to the attractiveness of the paper). The synopsis is very good, covering the main points and contributing insight to the paper, with Mariana’s experience in metals promoting GQs. The picture is also very elegant (as to be expected by Mariana’s pictures) and conveys the message of the paper. Despite her initial “opposition “to present this paper as her GM article, I think it’s a rather nice article and I’m glad to have read it. In this article Gang Wu and his coworkers demonstrated the free energy landscapes for the movement of three monovalent cations (Na+, K+, NH4+) across the central channel of a tetramolecular oligo G-quadruplex (OGQ) using molecular dynamics simulation (MDS). The free energy levels were determined through adaptive biasing force (ABF) method wherein a biasing force was applied to estimate the average force experienced by the system at any time. While, the ionic movement profile was studied through a complete potential of mean force (PMF). The ion movement was separated into two regions. The first region is inside the channel that ranged from the reaction coordinate along the channel axis (Z) defined by a “dynamic axis” in [d(TG4T)]4. The second region is from the channel exit/entrance point to bulk solution and the simulations were performed in three separate non-overlapping windows, each being 4 Å in length. A lower energy barrier (4-5 kcal/mol) was observed for Na+ compared to K+ and NH4+ (13-15 kcal/mol), for the inner OGQ region which was correlated to the differences in ionic radii; K+ and NH4+ having almost similar ionic radii (1.51 and 1.66 Å for octahedral coordinate ions ) while Na+ (1.18 Å) with lesser radius could diffuse through tetrads easily. The cations at the inner core are found to be in a complete dehydrated state while those at the entrance/exit positions in a hydrated state. Ionic transport (transport of ions through molecular channels) is a crucial topic always, as every cellular process to begin depends the selective transport of ions across the membrane barriers and ionic channels. The findings play a significant role in elucidating the selective transport of ions across the synthetic Olig G-quadruplex (probable role as ionic channels). Mariana’s synopsis appears to be very well presented. Her interpretation of the results is very good. The figure is also very explanatory and well depicted. In this communication Wu and coworkers present the free energy landscapes for the movement of three different monovalent ions (Na^+,K^+ 〖,NH〗_4^+) through the central channel of an oligo G-quadruplex (OGQ). For this purpose they used adaptive biasing force (ABF) along with MD simulations. To be able to investigate the energy profiles, they divided the movement of the GQ channel in two sections: within the channel pore between the entrance/exit point to, and the channel entrance/exit point to the bulk of the solution. In this first part of their studies, they found that the energy barrier for Na^+(4-5kcal/mol), was lower than that of 〖 K〗^+ and 〖 NH〗_4^+ (13-15kcal/mol). They explain that these different energy barriers were due to the radii of the ions, and since Na^+ had a smaller radii, it would move faster than the others. These values were also consistent with previous experimental data. They did another study to see if it was possible that a leakage through the side walls of the OGQ was possible, and they concluded that the energy barrier involved in this process was to large for it to be probable. In the second part of this experiment they observe that the energy barrier for K^+ 〖and NH〗_4^+ was 20kcal/mol, while for Na^+it was 14kcal/mol. They also mention that the ions inside of the channel was are fully dehydrated, but the ones at the entrance/exit point can be hydrated because of their transition to the bulk of the solution. This paper was very interesting and I really enjoyed reading it. I don’t know a lot about MD studies, but I understand that this is a very important step in this area and these types of studies can be used for many purposes. I also agree with Mariana that it would be interesting to test systems like ours in aqueous media. As for her synopsis, it was really helpful, and I always like to read her point of view in communications like this, since I always learn something new from her. The picture was very helpful too. I have to start by stating that the real novelty of this work is the use of an adaptive biasing force (ABF) method, which allowed the cation to overcome energetic barriers and the determination of free energy values. As the authors mention the trajectory of the cation have been previously reported for several system including G-wires, but the application of this method allowed the development of 3D free-energy landscapes. In summary, in this article Wu and co-workers study the role of DNA-GQ as artificial ion channels. Specifically they study the translation of K+, Na+ and NH4+ throughout several complexation sites. To accomplish this they performed Molecular Dynamics simulations, revealing that the movement of the cation from the center of the assembly to the external complexation site has a high free-energy barrier, 13-15 kcal/mol, for K+ and NH4+ and 4-5 kcal/mol for Na+. Also, theoretical studies evaluating horizontal movement of the cation, though the sides, were done indicating a high free-energy barrier of 50–60 kcal/mol. More importantly they study the movement of the cation into the bulk solution, obtaining a free-energy barrier of 4 kcal/mol for Na+, K+, and NH4+. By combining the computational results obtained for the entire trajectory, from the center to the bulk solvent, they obtain a free-energy barrier of approximately 20 kcal/mol for K+/NH4+ and 14 kcal/mol for Na+. To conclude they calculate the averaged number of hydration water molecules around the cation as it moves alongside the GQ channel axis observing an almost completely dehydrated of the cation in the inside of the channel followed by a quick hydration as the cation exit the channel. I found this article very easy to read and to follow, although I found figure 1 hard to understand. Figure 1b have an error it should be the y-axis instead of the z-axis. Also, in the text figure 1c is use in referred to the 13-15 kcal/mol and 4-5 kcal/mol values which with the normalization of the data is hard to observed from the graph, in fact to really get the values you need to look at the SI. I enjoy Mariana’s synopsis, she make a great job at delivering the information. And as always her analysis of the article opens the door for a healthy discussion. Although I really like Mariana’s figure, and I believed is a better TOC figure than the one the authors made, it gave the impression that the channel has directionality, this will be true if the channel were inserted in a membrane, since the process would be driven by a gradient.